Adrienne Sternlicht and Quidam MB. Photos © Sportfot. Wellington, FL – March 22, 2015 – The 2015 Winter Equestrian Festival (WEF) concluded its eleventh week of competition, sponsored by Artisan Farms LLC, with jumper competition featured on the grass derby field at The Stadium at the Palm Beach International Equestrian Center (PBIEC) on Sunday. The $50,000 Artisan Farms Under 25 Grand Prix Final, presented by The Dutta Corp. in association with Guido Klatte, saw a win for Adrienne Sternlicht aboard Quidam MB and crowned Lucy Deslauriers the overall winner of the 2015 Series. The $85,000 Suncast® 1.50m Championship Jumper Classic was held later in the day with a win for Kent Farrington (USA) and Waomi. Starting off Sunday’s competition on the derby field, 33 entries jumped in the $50,000 Artisan Farms Under 25 Grand Prix Series Final, with nine clear over Olaf Petersen, Jr.’s course. In the jump-off, Sternlicht and Starlight Farms LLC’s Quidam MB were the winners with the only double clear round in 48.49 seconds. Catherine Tyree and Don’t Go had the fastest four-fault round in 44.49 seconds to finish in second place, and Kelli Cruciotti and Serenity Equestrian Ventures LLC’s Chamonix H placed third with four faults in 44.71 seconds. Sternlicht (21), a sophomore at Brown University, trains with U.S. show jumper Laura Kraut. Her mount, Quidam MB, is a ten-year-old Oldenburg gelding (Quidam’s Rubin x Argentinus). Second place finisher Catherine Tyree (21) is a sophomore at Northwestern University, and trains with North Run’s Missy Clark and John Brennan. Tyree was aboard her 13-year-old Oldenburg stallion Don’t Go (Come On x Raphel). Kelli Cruciotti (17) has done well in the series all winter with her 14-year-old Swedish Warmblood mare Chamonix H, including a win in the speed class during week two. She was happy with her round to earn third place in Sunday’s Final. Sunday’s class was the final event in the 2015 Artisan Farms Under 25 Grand Prix Series, which also awarded top prizes for its overall standings after the competition. New York’s Lucy Deslauriers was the series winner for her performance throughout the winter. Nicole Bellissimo finished second overall and Catherine Tyree was third. Mavis Spencer placed fourth in the standings, and Eugenio Garza and Sophie Simpson completed the top six. As the overall winning rider, Deslauriers received a Bruno Delgrange saddle valued at $6,000, and are invited to compete at the CSI2* Chantilly Horse Show, to be held from July 16-19, 2015, in France. In addition to their entry, the winner also receives two tickets to the Chantilly VIP lounge, transportation for one horse generously provided by The Dutta Corp. in association with Guido Klatte, and layover at Artisan Farms in Vrasene, Belgium. Fifteen-year-old Deslauriers has had a fantastic week, including a win in Friday night’s George H. Morris Excellence in Equitation Championship, presented by Alessandro Albanese. On Saturday night, she was then presented The Potcreek Meadow Farm Junior Sportsmanship Trophy. Deslauriers rode Hester on Sunday, a mount that she has had for two years. She was thrilled to win the series and looks forward to her first time competing in Europe as her prize. Nicole Bellissimo (21), a Sophomore at Harvard University, was leading the series coming into Sunday’s competition with her mare VDL Bellefleur, and finished out the winter in second place overall. She was happy to see her young mare’s progression and consistency throughout the circuit. Now in its fifth year, the popular Artisan Farms Under 25 Grand Prix Series was expanded to feature more classes, increased prize money, and new ‘Under 25’ sanctioning by the United States Equestrian Federation (USEF) and the International Equestrian Federation (FEI) in 2015. Open to competitors of all nationalities aged 25 and under, the Series gives up and coming riders the opportunity to compete under FEI rules while also gaining valuable grand prix experience against their peers. With varying conditions offered for each class, riders have the opportunity to compete at a height of 1.45m on grass, all-weather footing, under the lights at night, and in team competition, all of which are important elements that competitors will face as their international careers progress. This year’s series, comprised of seven events, attracted riders from around the world competing for $170,000 in prize money. Sponsor Carlene Ziegler of Artisan Farms was pleased to see the development of all the riders in the series this year and congratulated the top competitors on their success. All of the top riders spoke to the experiences that the series has given them, including the chance to compete in different venues with different horses as well as the opportunity to get to know their fellow competitors. For Sternlicht, the opportunity to get to know the other riders has been a great experience, and she has felt camaraderie with the other competitors in the series this year. Competing on the grass field at The Stadium at PBIEC on Sunday, USA’s Kent Farrington won the $85,000 Suncast® 1.50m Championship Jumper Classic aboard Amalaya Investment’s Waomi. To conclude the eleventh week of WEF competition, 36 entries showed over Olaf Petersen, Jr.’s course, with five clear rounds to jump-off. Farrington qualified two horses, first and last to go on the short course. Farrington began the jump-off with what would prove to be the winning round aboard Waomi, clear in 38.18 seconds. Ben Asselin (CAN) and Attache Stables Doremi retuned with four faults in 42.20 seconds to place fifth. Darragh Kenny (IRL) jumped next with Caroline Lloyd’s Sans Soucis Z, clear in 40.15 seconds, to finish third. Harrie Smolders (NED) followed in 38.99 seconds aboard Axel Verlooy’s Enjoy Louis to move into second place. Last to go, Farrington returned aboard Amalaya Investment’s Willow with a clear round in 40.42 seconds to also earn fourth place honors. Farrington has had success with both Waomi and Willow in the 1.50m series this winter, among other top finishes throughout the circuit. Waomi won the $85,000 Suncast® 1.50m Championship Jumper Classic during week seven, and two weeks later, Willow won the class in week nine. Farrington described the two horses, as well as his plan for each of their jump-off rounds. Waomi is a 12-year-old Dutch Warmblood mare (Lupicor x Boreas), and Willow is a 12-year-old Dutch Warmblood gelding (Guidam x Little Rock). Farrington plans to rest Willow next week to show in Miami at the conclusion of the WEF circuit. Waomi will return to compete in week 12. On the final day of hunter competition for WEF 11, Sophie Gochman rode Dr. Betsee Parker’s pony, Elation, to the tricolor ribbon in the Visse Wedell, Douglas Elliman Real Estate Small Pony Hunters. Elation and Gochman won two of the over fences classes on their way to the winner’s circle. “I’m thankful that Betsee [Parker] lets me ride her wonderful pony,” Gochman smiled after the championship presentation. With Applause and Zayna Rizvi ended Sunday as reserve champions in the division. Rizvi piloted With Applause to a first and fifth over fences, paired with a win in the under saddle. “I’m lucky to have such great trainers, Scott [Stewart], Ken [Berkley], and Amanda [Derbyshire], to help coach me at the ring,” Gochman said. Only 12 years old, Gochman enjoys the competitive environment at WEF. “I feel like I have a challenge going into the ring because the competition is so good,” Gochman commented. Gochman lives in New York City and flies down to Wellington on weekends to compete, along with her mother and sister. While Gochman has competed in the pony hunters past years, she has recently started showing in the 3’3″ Junior Hunters and the Children’s Jumpers. The 2015 Winter Equestrian Festival continues with its twelfth and final week of competition, sponsored by Rolex, on March 25-29. The week features the $500,000 Rolex Grand Prix CSI 5* on Saturday, March 28. Other highlights include $34,000 1.45m FEI world ranking classes on Wednesday and Thursday, as well as the $50,000 Ruby et Violette WEF Challenge Cup Round 12 on Thursday. The $10,000 Holtgers 5-Year-Old Young Jumper Classic, $15,000 Adequan® 6-Year-Old Young Jumper Classic, and $20,000 Adequan® 7-Year-Old Young Jumper Classic will be featured on Friday. The $100,000 Suncast® 1.50m Championship Jumper Classic Final will be held on Saturday, and the $50,000 USHJA International Hunter Derby will host its first round on Saturday and its second round on the derby field Sunday. For full results and more information, please visit www.pbiec.com. Adrienne Sternlicht and Quidam MB. Photo © Sportfot. Wellington, FL – January 8, 2014 – Equestrian Sport Productions hosted the first day of competition for the 2014 FTI Consulting Winter Equestrian Festival (FTI WEF) on Wednesday with a full schedule of hunter, jumper and equitation competition at the Palm Beach International Equestrian Center (PBIEC) in Wellington, FL. The day kicked off with a win in the International Arena for 20-year-old Adrienne Sternlicht (USA) of Greenwich, CT, riding Quidam MB in the $8,000 G&C Farm 1.45m. Canadian Olympic Gold Medalist Eric Lamaze also got a win on the first day of competition in the $6,000 Spy Coast Farm 1.40m jump-off class with Zigali P S. Alexander Zetterman (SWE) won the $6,000 Spy Coast Farm 1.40m speed round aboard Canora. Week one of the 2014 FTI Consulting Winter Equestrian Festival, sponsored by The Mar-a-Lago Club, runs through Sunday, January 12. The week’s highlights include the $75,000 Nespresso Battle of the Sexes on Saturday, January 11, as well as the $30,000 Mar-a-Lago Club Grand Prix, which will be held on Sunday, January 12. 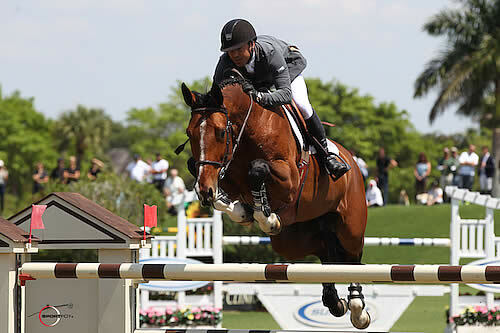 The FTI WEF features 12 weeks of world-class competition through March 30, 2014, awarding close to $8 million in prize money. Eric Hasbrouck is the course designer in the International Arena at PBIEC for week one competition. Hasbrouck saw 20 competitors over his $8,000 G&C Farm 1.45m speed track in the morning with seven clear rounds. Adrienne Sternlicht and Quidam MB secured the win with their time of 66.192 seconds. Shane Sweetnam (IRL) and Spy Coast Farm LLC’s Baldev finished second with their time of 67.670 seconds. Lauren Hough (USA) and Reconnaissance, owned by Laura and Meredith Mateo, went first in the class and set the pace with their time of 68.575 seconds and eventually finished third. Jimmy Torano (USA) and Ben Maher’s Dolores MB had the fourth place time of 69.997 seconds. Adrienne Sternlicht has owned Quidam MB, a nine-year-old Oldenburg gelding by Quidam’s Rubin x Argentinus, for two years now. The pair started in the Low Amateur-Owner Jumpers and then moved up to the High division last year. They have now taken the next step, and started off the 2014 FTI WEF circuit with an exciting 1.45m win. They also topped the High Junior/Amateur-Owner Jumper Classic at last week’s Holiday Finale horse show. Sternlicht trains with Linda Langmeier as well as U.S. Olympic Team Gold Medalist Laura Kraut. She was very excited to win Wednesday’s class over many top international riders, including Kraut. Sternlicht had the advantage of watching the top rounds before her on Wednesday and was able to plan her ride a little bit. She took note of what Shane Sweetnam had done, as he was leading the class before her round. Sternlicht hopes to move up to some bigger classes with Quidam MB during this year’s FTI WEF circuit. She will also compete with some of her more seasoned horses, such as S&L Slingback. She will compete during the first few weeks of FTI WEF and then commute back and forth between school (she is a Sophomore at Brown University). Sternlicht began showing in Wellington at a young age and has seen the show grow a lot. She looks forward to a great season. Canadian Olympic Gold Medalist Eric Lamaze rode to a one-two finish in Wednesday’s $6,000 Spy Coast Farm 1.40m jump-off class out of 64 competitors. Twenty-three entries advanced to the jump-off and there were 17 double clear rounds. Lamaze won the class aboard Artisan Farms LLC’s Zigali P S in a time of 33.628 seconds. He earned second place honors with Artisan Farms LLC’s Quelmec du Gery in 34.065 seconds. Laura Kraut and Stone Hill Farm’s Wish placed third in 34.268 seconds. The $6,000 Spy Coast Farm 1.40m speed was the final class of the day with a win for Sweden’s Alexander Zetterman aboard Canora. The class featured 37 horse and rider combinations with seven clear rounds. Zetterman and Canora finished in 60.181 seconds, well ahead of second place finishers Larua Chapot and Bradberry in 65.012 seconds. Hayley Barnhill and Cara Cheska’s Zephire placed third in 73.34 seconds. FTI WEF week one, sponsored by The Mar-a-Lago Club, will continue on Thursday with the $25,000 Ruby et Violette WEF Challenge Cup Round 1. The first hunter champions of the circuit will also be named. For full results, please visit www.showgroundslive.com.